Why Doesn't My iPad Keyboard Make a Clicking Sound? Is your iPad's keyboard too silent? By default, the iPad's on-screen keyboard makes a clicking sound every time you tap a key. This sound isn't just to make it seem like you are typing on a real keyboard. If you are trying to type quickly, having some audio feedback is a great way to let you know that you actually tapped the key. So what do you do if your iPad's keyboard is no longer making that sound? 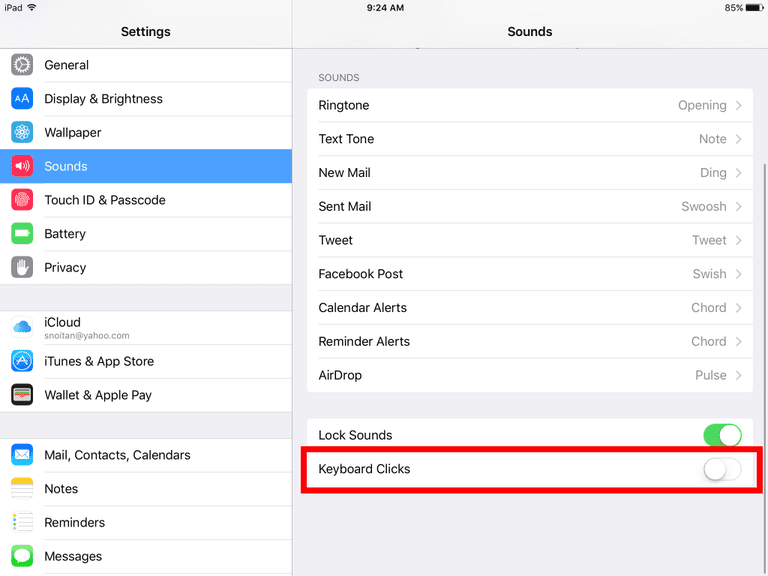 If you have searched through your iPad's keyboard settings looking for a way to turn this sound back on, you've been looking in the wrong place. Apple decided to put this particular setting in the Sounds category, even though it might make more sense for it to be in the keyboard settings. Scroll down the left-side menu until you locate Sounds. You will see options for changing the various sounds your iPad makes. At the very end of this list, you will find the option for Keyboard Clicks. Tap the button to turn the slider from Off to the green On position. What Else Can You Do From This Screen? While you are in the Sounds settings, you might want to take the time to customize your iPad. The most common sounds tend to be the New Mail and Mail Sent sounds. These will play when you send or receive mail through the official Mail app. If you receive a lot of texts through your iPad, changing the text tone can also be a fun way to personalize your iPad. And if you use Siri for reminders, you can set a new reminder tone. Where Are the Keyboard Settings? Go to the General settings. Follow the directions above, but instead of choosing Sounds, choose General. In the General settings, scroll down until you locate Keyboard. It is just under the Date and Time settings. You can make a lot of changes here. One really great thing to do is set up text replacement shortcuts. For example, you can set up "gtk" to spell out "good to know" and any other shortcut you want to put into the settings. Taking a moment to read more about the keyboard settings might just save you a lot of time. Did You Know You Can Split the iPad Keyboard in Two?